Your floor, especially hardwood, is a major investment for any home owner, and as such it demands special care and treatment. There is certainly no shortage of advice on how to clean your floor, though some people only want you to purchase their expensive cleaning products. Vacuuming is usually the most common way for cleaning hardwood floors, but did you know that it’s actually not that sufficient? A hardwood floor demands much more that a ritualistic movement of your vacuum from one corner to another. So, what more can you do to keep your hardwood floor elegant and alluring? A hardwood floor demands a lot of responsibility to keep it clean. If you give it adequate care, then its beauty will last for many years. Vacuuming the dirt and dust alone is not enough; you have to use various cleaning products that your flooring retailer has recommended. Each flooring manufacturer has specific products and specific instructions, and it’s best to follow them so as not to void your warranty. Most vacuum cleaners are not strong enough to remove all the dirt on your floor, and you might be inclined to apply more pressure to it. This extra pressure can cause damage, requiring you to dip into your pockets to restore your floor. You should get a vacuum cleaner that has either a brush or a felt head. A vacuum with a beater bar will only scar your hardwood floor with unsightly marks. Always do your research and read reviews from trusted sites on how to pick out the best vacuum cleaner for your floor type; this practice will save you a lot of time and money down the road. It is also a good idea to take time to train the maid/housekeeper on how to properly use a vacuum if you are not always around (assuming you have a maid). After some time, your hardwood floor may lose its shine and become a bit dull. It is a good idea to wax and buff the floor periodically with the help of a special buffer machine. In case you want a little help or guidance, ask your flooring retailer on the best waxing agents and methods. Personally I never try new try any new products or techniques without asking first, and this has saved me a lot of trouble. This might seem a bit antique but getting on your knees and using your hands is the best way to give your hardwood floor that extra attention. This is especially true if there are a few obstacles that might limit the effectiveness of your vacuum. Investing in a dust mop is a good idea to clean around the chair-legs and other round edges which a vacuum may not adequately reach. I regularly use an electrostatic cloth to clean my floor and it works wonders. When it comes to spills and stains, a vacuum cleaner will simply not help you. If spills are not wiped up quickly enough, you may end up spending more time and money trying to remove the resultant stains. Use a kitchen towel or a damp cloth to soak up the spill then spray the spot with a cleaner and leave it to dry. In case stains have formed, then patiently work at in from the outside in without scrubbing or using too much force. Cover your furniture legs with flannel protectors to protect your floor from scratches. Don’t drag furniture across the floor. Water is a hardwood floor’s biggest enemy so don’t allow it to stand for long. Stilettos and sharp-heeled shoes will only damage your floor. I always say love your floor, love your back! Your pets can scratch the floor, so keep their nails short. Now you know why it’s not a good idea to only vacuum your hardwood floor. Hardwood floors reflect back the love and the care that we give to them. Regularly vacuuming is important, but we need to do more to keep them shining and glorious for generations to come. You’ve just installed your hardwood floors as you set back and enjoy their beauty you start to wonder how to best protect your investment. The finish of hardwood floors can be easily damaged. Even the movement of dust on the floor while sweeping can over time dull the floors shine. This is why regularly vacuuming your floors is recommended by so many industry experts. There are many ways to keep wood floors looking great, but they usually don’t mention whether a canister or upright vacuum performs better. That decision is up to the individual consumer. Canister vacuums have a low center of gravity. This prevents tipping. They are designed for pulling. Most come with attachments specifically designed for hardwood floors. The head has a lower profile so it can easily fit under most furniture. This can be of great benefit for pet owners. Canister vacuums tend to be smaller than uprights making storage space easier to find. Because canister vacuums are pulled behind there is a greater chance of the vacuum getting caught behind obstacles. A perfect example of this is a kitchen with an island; the user will be cleaning away, round a corner, and be jerked to a stop. Investigation of the issue will show that the canister portion of the vacuum did not maneuver the corner, and is therefore stuck. For homeowners that have to deal with both carpet and hardwood, these vacuums do not transition as easily as upright vacuums. Upright vacuums transition very easily from you carpet or area rugs to hardwood floors. The transition often involves nothing more than the flip of a switch. They provide tools necessary to clean most household surfaces. Upright vacuums perform well and provide exceptional suction. The beater bar is a huge problem with upright vacuums. Although most offer the option to turn the bar off, forgetting once can cause major scratching to your floor (which takes a bit of effort to remove). Using the hose attachment for cleaning your floor presents a new set of challenges. Have you ever attempted pulling a device that is meant to be pushed? For those who haven’t I can testify to the instability of that endeavor. Which is a nice way of saying it will tip over; I believe this is a flaw in the design as the hose is usually short, stiff, and positioned in the back of the machine. Pulling the vacuum around backwards helps with the issue but the machine remains top heavy so spills are bound to occur. There is unfortunately no overwhelming answer to which is better. So much of the debate is dependent upon the preferences of individual consumers. The canister does seem to win the debate in the end, simply because it has less chance of actually doing damage to your floors. This is why canister vacuums tend to be the best vacuums for hardwood floors. With that being said, an interesting fact is that when asked; most hardwood floor owners demonstrated a preference toward stick style upright vacuums. While others recommended the use of back pack style vacuums, which have the perks of a canister without any of the inconvenience previously mentioned. Just make sure vacuuming is not the only cleaning method you use no matter what type you choose to go with. A portable hand vacuum cleaner offers you convenience because it can be carried around, which allows you to clean different sections of your home with ease. It is also compact enough that it easily cleans spaces that other cleaning devices can’t reach. When it comes to properly securing a top rated handheld vacuum, you may find it difficult due to the fact that there are so many different brands and models in the market. It is, therefore, necessary to use the tips below in order to make an informed selection. Majority of these devices are powered by batteries, which makes it necessary to choose one that has a long battery life, and takes minimal time charging. This is to avoid inconveniences related to drops in suction power or the powering off during operation. These details can be obtained from customer reviews on the model you intend to purchase or from the product’s manufacturer. When it comes to ergonomics, the weight of the device should be considered because it will affect the level of comfort you will receive from its use. The weight of these devices also determines how maneuverable they are, especially when it comes to cleaning certain areas like stairs. This is, arguably, the most important factor you need to consider because it is directly related to the effectiveness of the device. It is, therefore, important to ensure the following. The device should be fitted with a powerful motor that can easily pick up particles of any size without difficulties. The voltage required to power the motor should be high since it determines the power of the device. Experts recommend choosing a device of between 15 and 18 volts. Suction power is also dependent on the motor. The top rated vacuums have been found to feature motors of between 4 and 7.5 amps. The design of this gadget also affects its suction power. Online reviews will allow you to get the most reliable information in this respect. These types of devices are primarily meant to be used where their alternatives cannot be used, making it important to consider this factor. This requires you to select between those that are cordless and their corded counterparts. When making this choice, it is advisable to consider the distance of your cleaning area from the power source and the length of power cable that accompanies the device. This consideration is useful because it determines your indoor air quality. Make sure you select innovative and advanced designs in this respect, such as cyclonic filters because they are effective in trapping particles that can cause respiratory problems effectively. A device with multiple filters is the best since particles are trapped in various stages. The ideal vacuum is one that is easy to clean after using. The process of emptying its contents should be fast to ensure that you are not inconvenienced. It should also have a mechanism to prevent the trapped particles from escaping when emptying the device so that you don’t accidentally or unknowingly inhale them. Make sure that your purchase is accompanied by a warranty of at least two years. This is the number one indication of the product’s quality, and is a show of confidence from its manufacturer that you will get the proper service from its use. Handheld vacuum cleaners are perfect accessories for folks who can’t get their furniture, vehicles and other knick knack closer to the power outlet. Based on power-savvy technology, these vacuums are viable options for homes and offices. Here is a simplified list of the Best Handheld Vacuum cleaners from 2013-2014. If you’re planning to buy a brand new machine this year, just check out the specifications mentioned below. These swift, compact and portable gadgets are made for quick-pickup jobs. Owning to their small size, they can efficiently remove fine particles like food crumbs, pet hair and dust from different surfaces but there are certain disadvantages of owning these machines. They offer limited battery backups and take several hours to recharge. 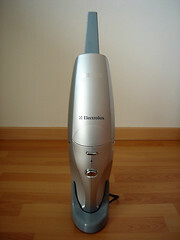 Black & Decker Platinum BDH200FL20: The widget features a unique cylindrical design. Powered by 18-vold batteries, BDH200FL20 offers smooth motor performance and a long crevice tool that reaches difficult corners. Black & Decker BDH20000L20: This lightweight device lasts for 30 minutes on full suction. Blessed with 20-stage filtration, competent crevice tools and rotating brush=head, this lightweight vacuum is a blessing in disguise for busy office goers. Black & Decker Pivot: With its amazing range of products, the brand occupies top 3 spots on the list. Ranking third from the top is B&D Pivot vacuum that features foldable nozzle, LED battery indicators and powerful motor suction. With a large, easy-to-use, transparent and easily detachable dirt cup, it’s meant for spot cleanups. Dyson D44 Animal Vac: High-quality, long extensions, effective motors and special pet cleaning accessories speak volumes regarding its high quality. It might not actually be THE best vacuum for pet hair, but it’s definitely a vacuum cleaner you’ll want to pick up if you have pet hair problems in your household. Hoover Linx Pet Hand Vac: This thingamabob works efficiently on flat surfaces like furniture, car seats, staircases, walls and doors. The motorized, rotating brushes pick up pet hair and fine particles from different surfaces. Quick charge time, interchangeable, long-lasting batteries and cyclonic dirt-repellant technology are its key features. Short run times, delicate batteries and weak suction power of cordless vacuums tend to irritate us. Nevertheless, you can avoid these issues with a powerful and long-lasting corded vacuum. Large is great, large is back in fashion! BISSELL Clean-View Deluxe 47R51: This wonderful thingy is furnished with powerful suction, wide range of attachments for carpets, floor, upholstery and staircase and HEPA media filters that capture noxious fumes, allergens and dust mites present in air. BISSELL Spot-Lifter 1716B PowerBush Deep Cleaner: Twin motorized brush rolls, handy brush cartridge removes and continuous suction make it one of the hottest models in the market. The widget sprays, cleans, blows and dries in one step! Dirt Devil 2.0 SD12000: 20-foot long cord helps you reach tricky spot and corners whereas motor-driven, high-performing brush=rolls, quick rinse filters and one-touch release dirt containers make it more efficient. Eureka EasyClean 71B: With double motors, innovative Riser Visor cleaning and innovative tools, the vacuum ranks forth on the list of best domestic cleaners. Black & Decker Pet Retriever Series (HV9010P): This amazing machine includes a fine turbo brush which is especially designed for pet hair. Cyclonic action, flexible crevice hose, blower hose and a 24-ounce translucent bowl take it one step ahead. Considering the type of job you perform on a daily basis, Dirt & Devil, Hoover’s Platinum and BISSELL CleanView are solid contenders. Contrary to this, if you’re looking for a versatile and easy-to-use gadget, you should opt for Eureka products. Remember to read their reviews before you make the final decision. The quality of your floor especially in the kitchen says a lot about you as a person. If it has been neglected, you will come off as lazy and irresponsible. Wood floors need great responsibility when it comes to cleaning and maintaining them. Before we discuss how to clean wood floors, you should note that the use of vinegar (as most people commonly believe) to clean them is a no-no. Vinegar being acidic, corrodes the poly coating or whatever material your floor is coated with. It is also noteworthy that the use of anything other than what has been recommended by your manufacturer will make null and void your warranty. There are many other safe ways to keep your wood floors clean and presentable. Also, do not use furniture sprays or oil when cleaning wooden floors. This is because oil leaves a residue on them while furniture spray causes the floors to become slippery. Without a clear idea of what the finish of your floor is, you should confirm what it has been coated with. This is because the finish used on it will greatly determine how and what you use to clean it. Surface-sealed floors: These are usually the easiest to clean. This is because they have been sealed by compounds such as poly-acrylic which are moisture, water and damage resistant. These are generally the easiest to clean. Oil treated floors: Here a penetrating oil finish is absorbed into the wood grain where it hardens. For this type of floor, you must treat it with either paste wax or the liquid type to ensure that it maintains its quality. Cleaning the floor routinely; there are places in the house which involve high activities. These are areas such the dining room, the kitchen and the bathroom. These ones can be swept on a daily basis and mopped at least after every fortnight. Areas such as the store where there’s little activity can be cleaned on a monthly basis. The technique for mopping; you don’t want to clean a wood floor with water even if it has been coated. Always use a damp mop instead of using a wet one. Insert the mop in bucket full of the prepared cleaning solution, squeeze it completely then mop towards the direction the wood grain is facing. You can ease the cleaning process for your floors through dusting it with a mop treated in a dusting agent of your choice. Also remember to pick up any particles on the floor that might lead to it being scratched. A good canister or upright vacuum is recommended. Apart from the light cleaning, you should do a deeper cleaning at least once every month to remove things like oil which could have missed during the light cleaning. This involves the use cleaning products recommended by the manufacturer. If you use the tips given above, cleaning your wood floor will be a lot faster and even enjoyable. All the best with keeping yours sparkling clean! A good hardwood floor vacuum is essential to proper maintenance of your floor. If dust, dirt and other particles aren’t addressed, they can not only make for a dull, dirty look, they can actually slowly erode your finish, which over time will wear your floor unevenly and unattractively. You’ll want to limit your choices to either upright or tube-style vacuum cleaners. Which is best for you depends on what you’re looking for. 1. Upright: An upright vacuum is a good multi-purpose machine. As long as it is designed to also work on hardwood floors, it’s a good choice that you can also use for your carpeted rooms. Just make sure that the brushes are off -you don’t want them scratching up your floor! 2. Canister: So-called because of the cylindrical or tube look, these are probably the best to use, as they are specifically designed to include brush-less cleaning to cover a wide range of surface types. They also tend to offer a greater amount of actual vacuum, which means it will probably pick up more particulate matter. Since this list is for the best vacuum for hardwood floors under $300, they will all be of the second (canister) type. Kenmore sells more canister cleaners than anyone out there and there is a reason why. At around $280, this feature-packed model includes adjustable vacuum speed to customize cleaning to the amount of dirt and dust on the floor, filtration that traps dust and pollen down to 0.3 microns, a crevice tool attachment, and even a horsehair tool specifically designed for bare floors. Hoover has to be included in any vacuum cleaner list. They’ve been making them for over 100 years, and provide quality that needs no description. At $299, this model is at the high-end of the affordability list, but the quality and effectiveness are pretty much without equal. The filtration system traps 99.97% of all dust and pollens down to 0.3 microns. The patented “WindTunnel technology” will remove more difficult particles such as embedded dirt. Add to this a ton of features and put it into a mere 24 pound package and you have a vacuum that will not disappoint. Panasonic may not be the first name you think of when it comes to vacuums, but they provide some of the best quality on the market. They also offer and extremely wide range of models to ensure something is available at any price range. At $299, this is at the top of the list. A convenient switch allows for easy transition to bare floor vacuuming, and a powerful 12-amp motor provides more than enough vacuum for your cleaning needs. This model provides an excellent vacuum package to take care of the whole house. Dirt Devil is widely known for making quality vacuum cleaners at affordable prices. At just around $180, this model still has the same high-quality HEPA filtration system as more expensive models, variable vacuum speeds, and an impressive list of accessories make this model great for cleaning the whole house. Hardwood floors add value to your home and they are easy to clean and to care for than carpet. However, they can become dull, scarred, or water damaged over a period of time. You can use some simple, cheap and easy ways to make your hardwood look new again, starting with cleaning and extend it to a refinishing. Here are easy steps to follow in order to make your floors appear like new again. You cannot complete this project by moving furniture around your work area. The room has to be emptied. Don’t wait until the time you bring the floor buffer home. You will be paying for it by the hour; you need empty the room first. Any contaminants on the finish must be removed in order for a new finish to cling to an existing finish. Such dirt include: ordinary dirt, grease, grime, dust, cleaning residue, soap film, aerosols, furniture polish, and wax. Do not clean with hot and soapy water or any kind of homemade recipes. Such chemicals may cause damages to the finish on your floor a, soap can leave a residue and excessive water can cause the wood to swell. Use a commercial floor cleaner which is designed to dissolve such contaminants without dissolving the already existing finish. Find the best vacuum for wood floors that you can afford and vacuum over the floor to make sure there are no leftover dust/debris lodged anywhere. Wipe the floor with a soft cloth. Give any remaining hardwood floor cleaner enough time to evaporate before going on. You can set up a fan to blow air across the floor. Since water based and oil based finishes cannot form a bond with a previous layer of finish, we need to create a bond between the two finishes. This is achieved by adding many tiny scratches to the existing finish. Use a floor polisher and a large synthetic pad or a hand polisher with a synthetic pad to lightly scuff the surface of the old or existing finish. Use a vacuum to remove the dust that has been created by scuffing. Avoid sweeping the floor, as a broom only pushes the grit into cracks between the boards. Vacuuming is not bad for cleaning wood floors, as long as it is not the only method you use. Follow manufactures advice to apply your chosen finish. However, choosing an appropriate finish is very critical. There is a big difference between “cure time.” and “dry time”. A finish may dry in just a matter of minutes, but it may achieve its absolute hardness in a period of time-generally about a week. Once the finish has dried, you can walk on the floor on feet; keep off shoes for an additional day. Wait for about three days before you bring in furniture. Do not use a recoat on floors with wax finishes since it will not bond, and it will result into a blotchy, peeling, ugly looking floor. Make sure that the room is well ventilated while working with chemical finishes and floor buffers. Never slide furniture across the floor regardless of how long the finish has cured. A worn furniture glide leaves an unsightly scratch in the finish. This simple guide will help you make your damaged wood floor look new again.